Canadian elections are pretty humdrum affairs – we don’t get very worked up by them unless there is a strong personal connection. 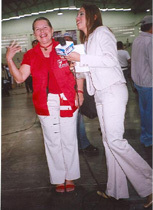 So we were not prepared for the intensity and excitement of elections in El Salvador when we joined an international election observers’ delegation for the 2006 elections for national deputies and mayors in El Salvador. The country seemed to be in a high state of fever. There seemed to be endless campaign parties and rallies – all had music that blasted throughout walls and neighbourhoods; people know the words to songs and chants and the enthusiastic crowds sway in unison to revolutionary music. Squeezed into the waist of the hemisphere by volcanoes and tectonic plates, El Salvador is small enough to drive across in a day. Violence is close to the surface, geologically and politically, in this volatile land. Earthquakes leave their traces, lava fields are still fresh and so are the memories of decades of repression, death squads and dictators; in the 1980s death squads dumped the bodies of their victims on lava fields outside San Salvador. El Salvador is densely populated with 7 million people; it has more industry than its neighbours, mainly textile; now much of it is in maquilas that lack labour and health standards. Food that could be locally produced is imported from Honduras and Nicaragua. Agriculture is in decline on land still mainly owned by a small oligarchy who now finds banking more profitable than farming. The story of landless peasants is the story, not only of Latin America, but of the power of capitalism. Of the many constitutional violations committed by the right wing ARENA government since the signing of the peace accords which ended the bloody twelve year civil war in 1992, one of the most significant has been displacement of the Colon by the USA Dollar as the currency of circulation. This makes it easy for money to flow uncontrolled through El Salvador and its hundreds of banks which, a Deputy told us, help launder Latin American drug money. 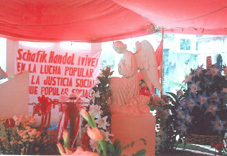 Our Canadian delegation of election observers was organized by the FMLN, (El Frente Farbundo Marti para la Liberacion Nacional), the Salvadorian left wing party that was created by the guerrillas after the peace accords – many FMLN members and politicians were fighters and have passionate memories and stories of their experiences in the civil war. The FMLN took good care of us and gave us many opportunities to learn about the history and culture of El Salvador. I became addicted to pupusas. Photo: pupusa maker outside polling station. We were collected at 5 am to be at the Exhibition Grounds of San Salvador at 6 am for admittance as registered observers. We drove streets where every utility pole was plastered with election posters, enormous party logos were on sides of high rises; road cuts, bridges, walls and fences were painted with party slogans, even the curbs were ribboned in party colours and initials. No mistaking this was election time! We saw the faces of candidates so often they seemed like old friends. In these elections mayors of cities and municipalities and deputies, members of the national government, were elected. There is a history of fraud, intimidation and many irregularities in the elections since the Peace Accords. Clearly observers are needed to provide an international witness to procedures. As we entered the big Exhibition Hall we passed long lines of people waiting to vote when the polls open at 7 am. These were mainly street vendors who needed to vote early before their long work day. In San Salvador, polls opened to the public closer to 8 am. In many communities not until 11 am do the papers and ballots arrive and the voters can enter. This is a major hardship for those who have to get to work – but as they are likely to vote FMLN and the ARENA controlled Electoral Tribunal doesn’t really care. We were greeted in the building by a sea of party colours. FMLN in red, red, and more red: ARENA in red, white and blue, like the USA or Pepsi. Smaller parties had combinations of white, green and yellow. There is no bland neutrality in Salvadorian polling stations. 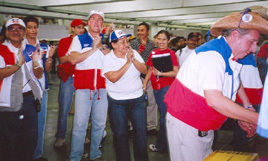 Vigilantes (scrutineers) and supervising party officials all wear their colours. The voting halls are social centres; voters, also in colours, hang around and chat. Then every few hours, party demonstrations crank up the temperature with sudden appearances of party bigwigs and noisy minders. Vigilantes and others jump to join in. It is against the election rules; campaigning was supposed to end two days before, but these demonstrations, amazingly to us, are considered traditional inside voting places. As the long hot day winds on, many officials and vigilantes who have been working long hours, begin to doze off, so the excitement helps to keep them awake until 5 pm when polls close. Then each poll of 400 voters counts its own ballots; this process we watch carefully, particularly when there was doubt as to the voter’s intention, the cross may not be completely on the right symbol. (The ballots have no writing because many people are still illiterate.) 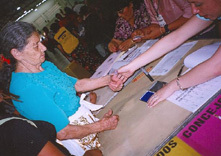 The counting process turns out to be very important in San Salvador. One day we visit the city central square and went to the cathedral where Oscar Romero is buried. Nearby market stalls display the goods that carry only male icons – Romero, Che and Schafik, the FMLN leader who died in January. Not a single female image on a T-shirt, poster, clock or dinner plate. Not even the Virgin Mary. 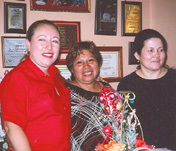 Dr. Violeta Menivar was the FMLN candidate for mayor of San Salvador. At the end of counting ballots she was 40 votes ahead of the incumbent ARENA candidate (an ex-FMLN member). The electoral tribunal would not declare her the winner until after four days of re-counting & examining the 150,000 ballots cast. 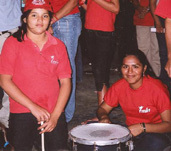 During that time the FMLN rallied every night outside of election headquarters (in the Radisson Hotel) demanding Violeta’s victory until she was declared winner by 64 votes – the first woman mayor of the capital city. We like to think that our presence during the election prevented 64 or more fraudulent votes in the city and helped elect Violeta – the first of many possible female icons. An ex-guerrilla fighter and a public health doctor, she is committed to tackling pollution, public safety, transportation and promoting citizen accountability. She has decreased the salaries paid to city council – appointed like a cabinet; she will include representatives of social movements as well as FMLN members on this council. The FMLN won 39% of the popular vote in the country and elected 32 deputies out of the 84 total; ARENA elected 34 deputies with the same popular vote. The FMLN strength is in cities where constituencies have more voters. The FMLN has 54 out of 262 mayors; again they won in bigger centres that make up 40% of the population. Three small parties won the rest of the votes. In Apopa, a neighbouring municipality of half a million, Dr. Luz Estrella, another possible icon, was re-elected as mayor. She is a young medical doctor and was involved in the long, successful struggle to prevent the privatization of medical services in El Salvador. She has initiated a youth centre and many youth programs and a women’s group that focuses on education, job-training and violence prevention. 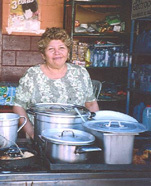 As in many Salvadorian communities there are more women than men; most of them struggle for a living in the informal vending sector for themselves and their families. Men have disappeared or have left to seek work elsewhere, some send money home, others make a new life and loose contact. Young people, at home while mothers work, are vulnerable to the pressures of gangs involved in crime, directed from the USA. Only 52% of Salvadorians turned out to vote in this non-presidential election. 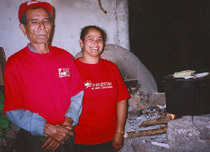 The FMLN has concentrated on urban areas with meetings, door-to-door and personal campaigning. ARENA can spend its undisclosed funds on mass media advertising and various forms of intimidation, particularly in rural areas where voters don’t have the anonymity of cities. We heard of many kinds of fraud during the election – false identification, busloads of Nicaraguans & Hondurans coming in with Salvadorian ID, people given money and alcohol to vote (sounds like Canada, a few years ago) and others who supported the FMLN being refused the right to vote; ARENA’s threats to cut funds for schools, clinics, roads etc. frighten many rural voters. By far the biggest obstacle to an FMLN victory with its agenda of public ownership, demilitarization, citizen participation, currency renewal, opposition to CAFTA and debt control is the USA policy of ‘Full Spectrum Dominance’; Central America has been the USA’s backyard for more than a century. The land, industry and military are controlled by a pro-USA wealthy elite. Two-third’s of El Salvador’s national budget services its international debt. Because El Salvador is the only country in Central America to have troops in Iraq and hosts an expanding USA military base; first the war on drugs, now the war on terror, are excuses for this Comalapa base, established by an agreement passed illegally in the national assembly by simple majority instead of the constitutional two-thirds majority needed. All these deals were made by the pro-USA ARENA government; El Salvador has “most favoured nation” status with the USA. This militarization challenges the legitimacy of the 1992 Peace accords which called for demilitarization. The agreement allows the presence of USA troops in the countryside, causing apprehension, the fears created by bad memories, and creating much discussion about the real objectives of the USA in El Salvador – apart from the daily intimidation by this armed presence. Over one million Salvadorians live and work in the USA sending back two billion dollars to their families. That money is spent on consumer goods, food and clothing, and also items like cars and luxury goods that help the USA economy, but do not contribute to local development that might provide work to keep people at home. This extended form of economic and cultural colonialism frightens Salvadorians into voting ARENA when they hear threats that the USA will send home Salvadorians if FMLN forms the government. Recently in both countries workers have demonstrated for labour and immigration rights; witness the big rallies across USA. It is a short term but necessary solution; until work opportunities and land reform are created at home Salvadorians will be vulnerable to USA dominance. For the first time in decades, Latin America is asserting its independence. Bolivia, Uruguay, Cuba and Venezuela are giving hope to progressive forces in other countries. Exciting new agreements are being reached with Venezuela; San Salvador and other FMLN communities will get petroleum from Venezuela with very favourable repayment conditions to use in public transit and to fund public services. We met with doctors who administer “Operation Miracle”. This arrangement sends Salvadorians to Cuba or Venezuela for surgery to treat three eye problems; the only conditions are that people be healthy enough to travel and too poor to pay. Since it started, 100 patients have taken the journey every week for the miracle treatment. Many students are also going to Cuba and Venezuela to study medicine on scholarships. Important programs, but more important is the solidarity and the sense that progressive forces in this small country are no longer alone. 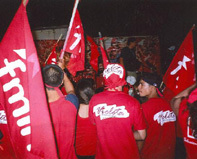 One striking feature of this election was the dominant role of youth in the FMLN. 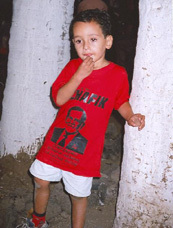 Young people did most of the grunt work – the postering, the driving, delivering campaign materials all over the country and conducting the ‘casa por casa’ door to door campaigning. Young people were hard working and enthusiastic. We could not help thinking how Canadian young people say electoral politics are irrelevant. If there is a real alternative that is committed to social justice and democracy for all, young people seeking hope will participate along side of older people who want a better future for all. The results may show in 2009 when the president, deputies and mayors are elected together. I am sometimes asked why I do solidarity work in other countries, that there is so much to do at home. Yes, I agree. I go to other countries to learn and contribute what I can and to discuss our common interests and goals. In solidarity we share strength, knowledge, and commitment; together we create and nurture a global commons of resistance. We unite in the struggle, a struggle that is beginning to look the same everywhere. As my friend Kay Macpherson said: When in Doubt, Do Both! Theresa Wolfwood, Barnard-Boecker Centre Foundation, Victoria, BC, CANADA.